Mile High United Way and Virgil Green, Denver Broncos tight end, believe all children should enter school prepared, ready to learn, and reading at grade level by the end of third grade. When Virgil Green visits Columbian Elementary School, students notice. 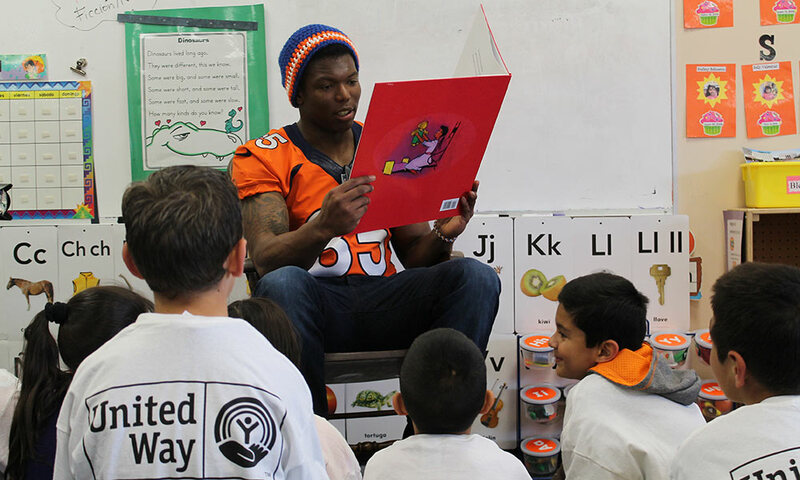 It’s not every day that a Denver Bronco reads with them – but it does happen every week. Named the Denver Broncos Community Champion Award winner in 2014, Virgil continues to dedicate his time to the Metro Denver community. This year, he adopted a Columbian Elementary School classroom as a volunteer with Mile High United Way Power Lunch program. Virgil began his partnership with Mile High United Way in 2011 with Power Lunch, a program that brings together businesses and schools to improve children’s early literacy and develop a love for reading. The program pairs volunteers with second grade and third grade reading buddies for the entirety of the school year, which helps to build trust and provides students a consistent mentor while developing their reading skills. As a Denver Broncos team member, Virgil serves as a role model for the students at Columbian. He is humble about his influence. “I’m nobody special, I just happen to play football,” he says. Now, students will get to flex their brains too, as they continue reading with their buddy each week. Your support of Mile High United Way ensures our youngest community members become self-sufficient adults through programs like Power Lunch, which builds students’ confidence and skills, enhances teamwork, and fosters corporate presence in the community. This individual attention that volunteers provide helps our early grade students become stronger readers by improving fluency and comprehension. Learn more about joining Power Lunch as an individual or with coworkers.